Benjamin Franklin (January 17, 1706 [O.S. January 6, 1705] – April 17, 1790) was one of the Founding Fathers of the United States. 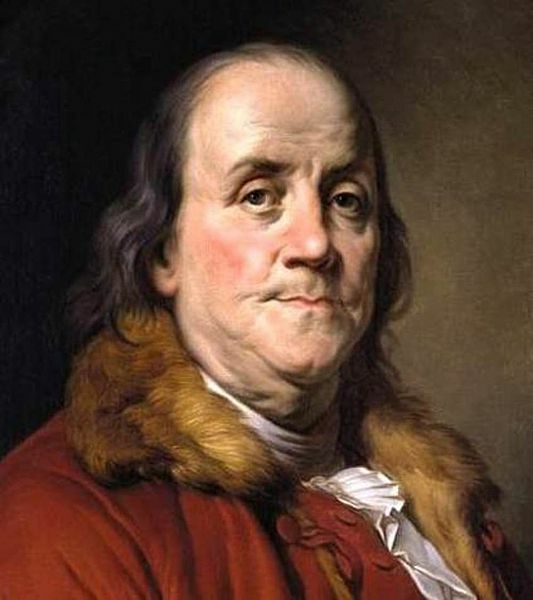 A noted polymath, Franklin was a leading author, printer, political theorist, politician, postmaster, scientist, musician, inventor, satirist, civic activist, statesman, and diplomat. As a scientist, he was a major figure in the American Enlightenment and the history of physics for his discoveries and theories regarding electricity. He invented the lightning rod, bifocals, the Franklin stove, a carriage odometer, and the glass ‘armonica’. He formed both the first public lending library in America and the first fire department in Pennsylvania. Franklin earned the title of “The First American” for his early and indefatigable campaigning for colonial unity; as an author and spokesman in London for several colonies, then as the first United States Ambassador to France, he exemplified the emerging American nation. Franklin was foundational in defining the American ethos as a marriage of the practical and democratic values of thrift, hard work, education, community spirit, self-governing institutions, and opposition to authoritarianism both political and religious, with the scientific and tolerant values of the Enlightenment. Most men die at age 25 but are not buried until they are 70.